A student from The Grammar School at Leeds who had a close shave for charity is nearing his £1,000 fundraising target in aid of diabetes research. The fundraising effort was a long time in the planning for Lucas Morrison, Year 8, who came up with the idea of losing his locks for charity last year. He then had to put off the head shave until almost the summer holidays to comply with the school rules on appearance. Lucas wanted to help other children living with type 1 diabetes by fundraising for the charity JDRF, which funds research to cure, treat and prevent type 1 diabetes and its complications, and gives support and a voice to people with the condition and their families. At the last assembly of the school year, the whole of Year 8 looked on as hairdresser Suzanne Ball shaved Lucas’s hair, which had grown untrimmed for almost a year. Lucas talked to his peers about living with diabetes type 1, and the school nurses told the children more about the condition and how it affects people in their daily lives. 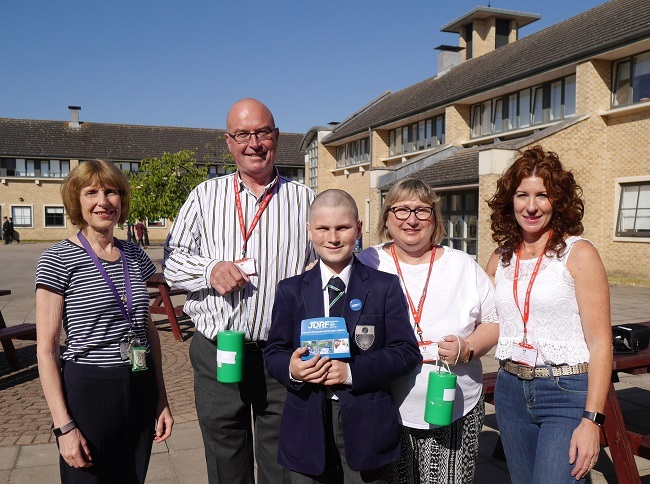 Lucas is collecting donations for JDRF via Justgiving He is pictured sporting his new hairstyle with (L-R) head of Year 8 Carol Heatley, parents Steve and Nicola Morrison, and hairdresser Suzanne Ball.